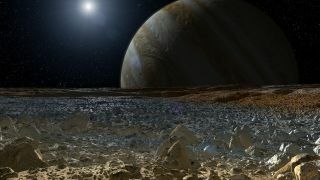 This artist's concept shows a simulated view from the surface of Jupiter's moon Europa. Europa's potentially rough, icy surface, tinged with reddish areas that scientists hope to learn more about, can be seen in the foreground. The giant planet Jupiter looms over the horizon. Jeff Nesbit was the director of public affairs for two prominent federal science agencies. This article was adapted from one that first appeared in U.S. News & World Report. Nesbit contributed the article to SPACE.com's Expert Voices: Op-Ed & Insights. Is there life on Europa, Jupiter's moon? Perhaps — but researchers may not know for years, or even decades, depending on the outcome of wars over NASA's budget that broke out before Congress went home for its August recess. Scientists know very little about Europa, one of Jupiter's largest moons. NASA's Voyager 2 and Galileo spacecraft together flew by the moon a dozen times and took some of the most captivating pictures of it from space. But the Galileo mission was nearly 20 years ago, and Voyager 2 was in 1979. Still, the pictures those and other missions sent home were enough to keep scientists guessing about what might lie beneath Europa's fractured, ice-covered exterior. Under a thick crust of ice, Europa might have an ocean warmed by tidal interactions with Jupiter. This tidal flexing could also produce a geologically active core that might in turn create hydrothermal vents on the ocean floor. Newer research, funded by both NASA and the National Science Foundation, has shown that microbes can survive in even the harshest environments — near the edge of underwater volcanoes in the deep oceans or in the iciest of conditions on Antarctica. So if there's a liquid ocean on Europa, there might also be microbial life. When NASA sets out on a planetary science mission, it starts with the big science questions that need to be answered. That's what a NASA "science definition" research team, drawn from the agency's various centers, did in the recent Astrobiology study. The scientists laid out the biggest questions that need to be answered if NASA is going to land a spacecraft on Europa. "If one day humans send a robotic lander to the surface of Europa, we need to know what to look for and what tools it should carry," said the study's lead author, Robert Pappalardo, from NASA's Jet Propulsion Laboratory in California. "Europa is the most likely place in our solar system beyond Earth to have life today, and a landed mission would be the best way to search for signs of life." In perhaps its first activity, a NASA mission to Europa would look for a marker of microbial life near fissures on the moon's surface. "The hope would be that surface materials, possibly near the linear crack features, include biomarkers carried up from the ocean," said Ames researcher Chris McKay, a senior editor for Astrobiology. Just as NASA did with the Mars rover, the agency would have a lander on Europa take a large number of pictures up close — providing a human-scale context vastly different from the pictures Voyager 2 and Galileo captured from space. The rover would also look for geological activity and the presence of liquid water. The American public is fascinated with planetary science, and such a mission would capture public support. More than 30,000 Americans have now paid a small fee for a one-way trip to Mars a decade from now, sponsored by a start-up foundation called the Mars One project. More than 100,000 people worldwide have signed up to spend the rest of their lives on the Red Planet, the project's founder announced recently. Life-threatening details — like whether people will be exposed to lethal space radiation during the one-way trip to Mars or how the settlement will be permanently funded — are a long way from being answered. In spite of that, the response has been strong, clearly showing that the public wants to explore the rest of the Earth's solar system. People are inspired by space travel and planetary science. However, the White House — and to a lesser extent, parts of the House of Representatives — have not shown the same enthusiasm. There is currently a three-way fight — amongst the House, the Senate and the White House — raging in Washington, D.C., over NASA's planetary science future, and this fight was on full display as the space agency's budget was debated in July. The battle began when the White House submitted its fiscal year 2014 NASA budget to Congress. While the overall number was unchanged from last year's budget, the White House proposed to significantly cut the planetary-science and space-exploration portions of NASA's budget to make way for other priorities. Then, the House Appropriations Committee weighed in, proposing to cut NASA's overall budget deeply, below President Barack Obama's request. NASA has argued against the deep cuts. "This proposal would challenge America's preeminence in space exploration," NASA Associate Administrator David Weaver wrote in a blog on the eve of the House panel vote. "We are especially concerned [that] the bill cuts funding for space technology, the 'seed corn' that allows the nation to conduct ever more capable and affordable space missions." Next, the House Committee on Science, Space and Technology proposed cutting NASA's budget even further, in line with sequestration guidelines. The House's Senate counterpart restored those cuts, setting the stage for a budget shootout when Congress returns in September. NASA's fiscal 2014 budget has to be finalized by the end of September. So what's the future of a proposed mission to Europa that would check for life beneath that moon's icy surface? It depends. The White House's Office of Management and Budget (OMB) doesn't see a need for such a mission. House appropriators, from both parties, clearly do — because they approved nearly $100 million more for planetary science in NASA's budget (with cuts elsewhere to offset the increase) than the White House did. The Senate has yet to state its priorities. "The nation's planetary science program has been under sustained attack from the White House budget cutters, and remains in jeopardy," Rep. Adam Schiff (D-Calif.) wrote recently in an unusually critical opinion piece attacking the White House for its NASA budget. "Time and again, deficit hawks in the Office of Management and Budget have targeted specific parts of the NASA portfolio for disproportionate cuts, and none more so than arguably the most successful of all NASA's recent achievements — planetary science." Schiff explained why the House appropriators restored the money for planetary science in NASA's budget, moves which would allow NASA to begin planning for a Europa mission. Based on new evidence from Jupiter's moon Europa, astronomers hypothesize that chloride salts bubble up from the icy moon's global liquid ocean and reach the frozen surface where they are bombarded with sulfur from volcanoes on Jupiter's moon Io. "Some in Washington have questioned why funding these missions is such a priority in an era of austerity and deficits. Plainly, the bureaucrats at OMB think the search for life on other planets to be an expensive, quixotic and dispensable activity," wrote Schiff, who sits on the Appropriations committee. "Profoundly important research and development and all the economic benefits it brings will be forsaken if we abandon the field," he said. "Planetary science is about seeking the answers to questions as old as mankind — and perhaps older. Are we alone? What is the nature of the universe and our place in it? Americans come from a long line of explorers. Are we really content to take a back seat now?" If there is microbial life on Europa, finding it will depend on human life in Congress. A version of this column appeared as "Life on Europa" on the blog At the Edge by Jeff Nesbit on U.S. News & World Report. His most recent Op-Ed was titled "Honeybee Collapse May Have Complex Cause." The views expressed are those of the author and do not necessarily reflect the views of the publisher.